Hi everyone! Welcome to the latest round of the Artisan Design Team Blog Hop! We are trying something new this month. Each week we will all be featuring the same product. So that means in one week, you will see sixteen different projects using one stamp set or other product. Isn't that awesome?!?! Talk about some serious inspiration! Let us know what you think about this new plan; we love to hear from you! This week, we are featuring the beautiful Mother's Love Stamp Set. I love this stamp set for a Mother's Day card, but I wanted to make a scrapbook page of this great picture of my mom and I from Convention last year. However, I didn't have any 12"x12" Whisper White Card Stock, so I decided an 8-1/2"x11" scrapbook page would be perfect. Then I loved the finished page so much, I decided it needed to be framed so it could be displayed all the time! The soft water-coloring pairs beautifully with the fun Gold Soiree Designer Series Paper for a pretty layout that really lets the picture shine. The page has lots of little details like some gold splatters, sequins, and stitching, all of which makes it really special. I stamped this sentiment from the set twice - once on the page in Garden Green and again in Gold on some scrap paper. I then cut just the gold "Mom" out so it would stand out and create some really fun layering on the page. 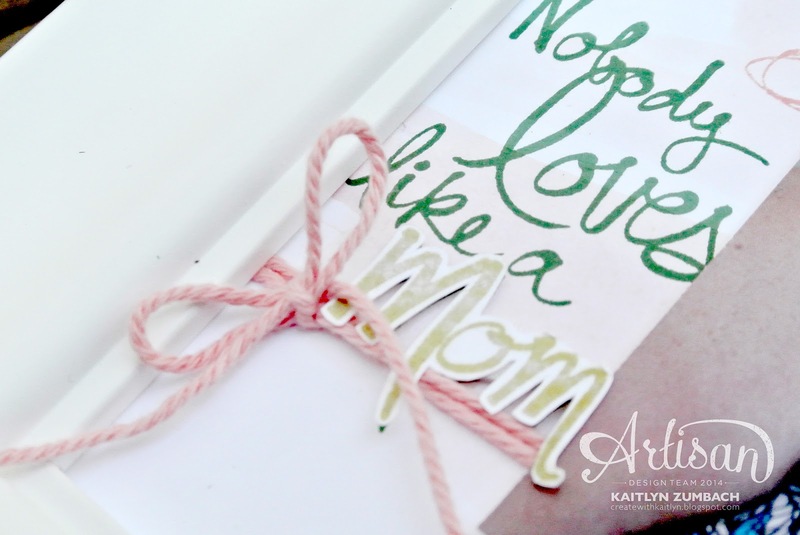 An easy bow of Crisp Cantaloupe Twine finishes the page with another soft detail. 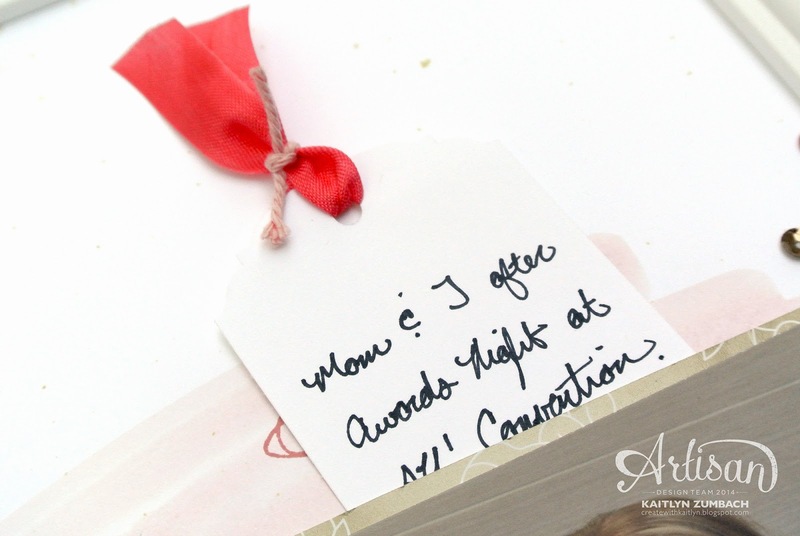 I was able to sneak in some journaling on this tag that hides behind one of the layers. I love this little trick because it allows the image to stand on its own without any competition from the journaling. Just be sure to only adhere your pocket layer on three sides so that you can slide a tag behind it. 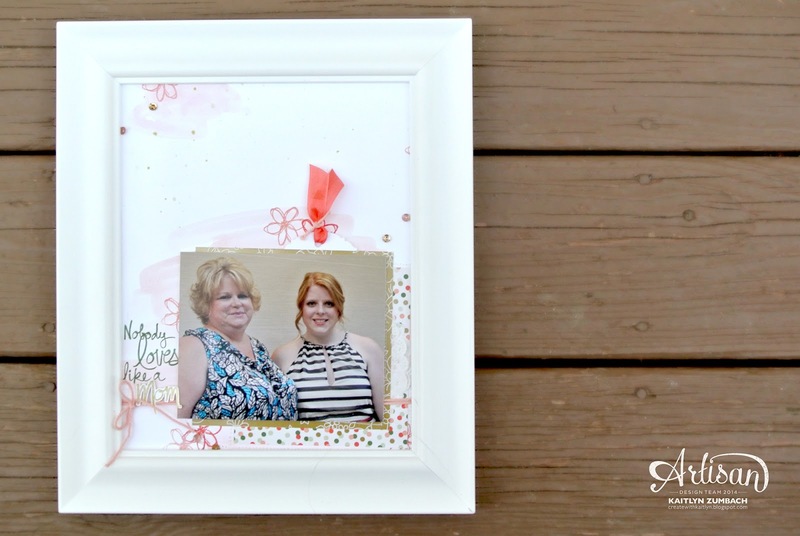 Continue along the blog hop to see more projects with the Mother's Love Stamp Set by using the button below! Just beautiful, I wish the image of the whole frame was just a little bigger to see all the details. I am sure your mom loved it.